Companies regularly re-brand themselves as part of their natural process of evolution and development, adapting to an ever-changing world. 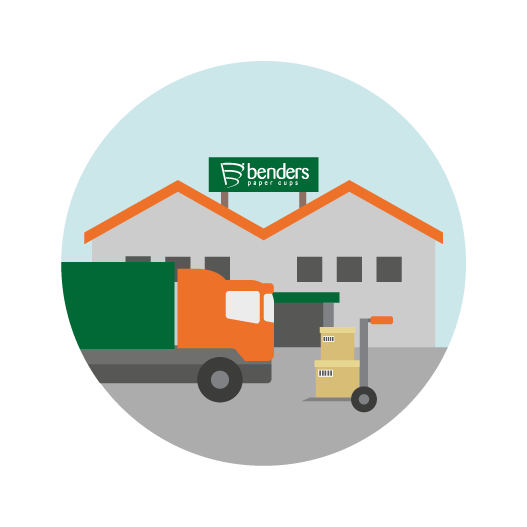 Benders Paper Cups a leading UK manufacturer of paper cup products are able to help them extend that branding and build customer awareness. In the age of climate change, air pollution and other man-made phenomenon’s, environmental sustainability is a necessary part of any company’s brand today. Using products made from sustainably sourced materials that can be recycled post-consumer use, such as paper cups, enables a company to showcase its environmental credentials, proving that its values are inline with its practices. Take Connect Vending, for instance. At the heart of their new business and brand values lies sustainable sourcing across the breadth of its products range and best practice care of the environment. Having previously used plastic cups, they switched exclusively to paper cups (manufactured by Benders Paper Cups) to convey the caring and understanding they have for the environment. Olid Uddin, Connect Vending Marketing Manager, ‘customer enjoyment is much more than just the drink, it’s about the total experience, and our customers need this to deliver on their environmental beliefs as much as beverage quality’. Benders Paper Cups believe that its cups are well-placed to project the kind of image a modern business needs. They manufacture a wide range of paper vending cups, with environmentally friendly water based custom printing to endorse and promote customer branding. Adrian Pratt of Benders Paper Cups, ‘we are ideally positioned to endorse the Connect Vending values, all of our cups are made in the UK, all our cupboard is sustainable with PEFC Chain of Custody accreditation and we’ve retained BRC/IOP Global Standard for Packaging and Packaging Materials A Grade status for three years running’. 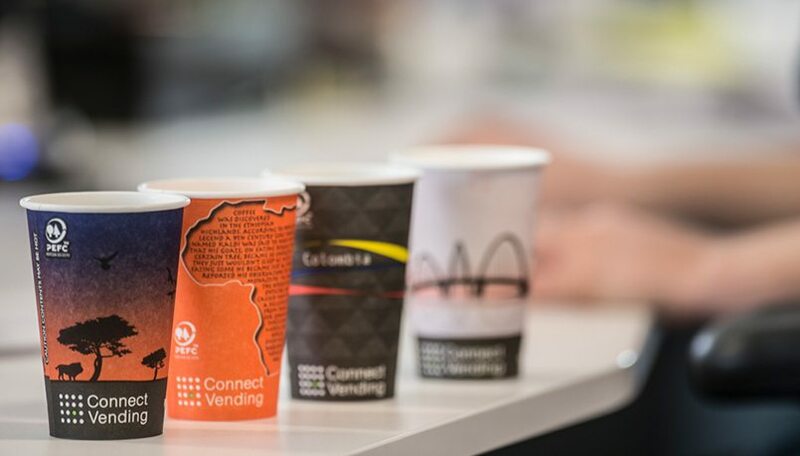 The Connect Vending brand itself is the champion of the new positioning and the company has even gone one step further by joining forces with Simply Cups, who will ensure that its paper cups are collected and recycled into the highest value new material possible. Connect Vending will communicate the new positioning with exciting and innovative designs on the cups. Olid continues ‘apart from the machines, the cups are our only direct connection to the end user in getting our image across. We worked closely with Benders in bringing our designs to life and hope this will be a stepping stone in doing more exciting projects with our paper cups in the near future and encouraging sustainable recycling’. Benders paper vending cups enable Connect Vending to take their new message directly to their customers, quite literally right under their nose. The range of designs included will add an extra dimension of interest to each drink served. Going forward Connect Vending will continue to enhance our brand environmental identity and push the boundaries of their cup designs. Our mixed sleeves for 2016 was a major step forward for us, drawing inspiration from the great coffee producing nations Brazil, Colombia and founding continent Africa! The vision is to release innovative new cups every year for their end users.